Probably more often than we think do failed recipes turn into beautiful new dishes. Sometimes kitchen experiments are a total bust (like my runny, undercooked blood orange curd from last month or my molten hazelnut brittle that nearly caught the kitchen on fire from the holidays), but sometimes they turn out gloirously - which keeps us coming back for more. And sometimes we think recipes are heading in one direction, and they turn into something completely different. For me, this usually happens when a dish is about to take a turn for the worse, and I frantically think of ways to save it - or at least parts of it. This cake started out as a layer cake for my book. It way layers of limoncello chiffon cake with thyme macerated strawberries and freshly whipped cream. As delicious as that sounds (doesn't it? ), it was a bit too similar to another dish that already solidified its spot in the manuscript. I tried to make some slight modifications, but it was no longer working as a layer cake nor for that section of the book. 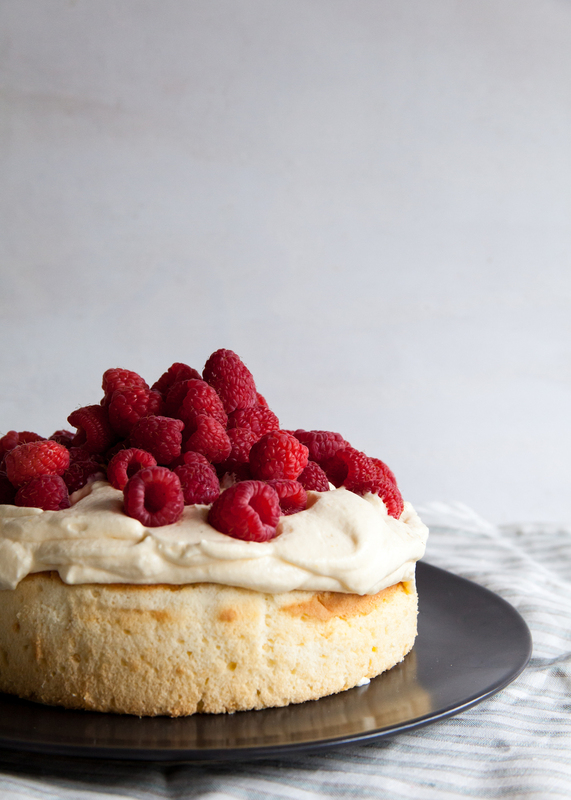 The components on their own - heavenly lemon mousse, angel-soft chiffon cake, and juicy, ripe raspberries - were amazing, so I turned them into this simple Lemon Mousse Cake for you all to enjoy. The baby toes in the pic (which is now one of my all-time favourites that Brett snapped of us while testing out the lighting in our kitchen) might have you thinking that this cake is part of my Baking with Baby series, but you would be wrong. It is not extremely difficult or anything, but all the folding would definitely be hard to do while holding a squirming baby. However, the finish is unfussy and simple with just a pile of fresh berries, which you can certainly throw on with one hand or attempt to juggle to entertain said baby, if you feel inclined to do so. The lemon mousse is so so dreamy. You can make it completely from scratch with your own lemon curd, or just fold in some pre-made curd (not all jarred lemon curd is created equal - make sure to get the good stuff). Once chilled, the mousse held up much much better than I thought it would. It was still not sturdy enough to be the filling in a layer cake, but it remained in a heaping cloud of deliciousness all afternoon in my refrigerator without breaking down nor slipping off around the sides. Even the leftovers the following day were amazing! Preheat oven to 350 degrees. Grease and flour one 9-inch cake pan and set aside. Sift together the cake flours, baking powder, a salt together in a large mixing bowl and set aside. In the bowl of an electric mixer fitted with a paddle attachment, mix together the oil, sugar, and lemon zest. With the mixer on low, add the egg yolks one at a time. Turn the mixer up to medium and beat until pale in color - about 3 minutes. Add in the lemon juice and water. Add in the reaming dry ingredients and mix until combined. Scrape down the bowl and transfer the batter to the large mixing bowl. Wash and completely dry the bowl of the electric mixer. Add in the egg whites and whip with the whisk attachment on high. Add in the cream of tartar and whip until medium-stiff, but not dry, peaks. Gently but dibelatry fold the egg whites into the cake batter. Pour batter into the prepared pan and bake until golden and a toothpick inserted into the centre of the cake comes out clean- about 30 minutes. Let cool on a wire rack 15-20 minutes before removing the cake from its pan. For the mousse, place the other 3 egg whites in a clean, dry mixing bowl. With an electric mixer with a whisk attachment, whip whites on high. Add in the sugar and whip until medium-stiff, but not dry peaks. Place lemon curd in a large mixing bowl and gently fold in the whipped egg whites. Set aside. In the bowl of an electric mixer, place the heavy cream. With the whisk attachment, whip the cream on medium. Once the cream begins to thicken, add the vanilla and increase the speed to high. Whip cream until medium peaks. Gently fold the whipped cream into the lemon curd mixture. Top the cooled cake with a generous amount of lemon mousse and a heaping pile of fresh raspberries. The mousse is made with uncooked egg whites. I strongly suggest using organic, free-range eggs - and you may not want to risk it if you have dietary restrictions.